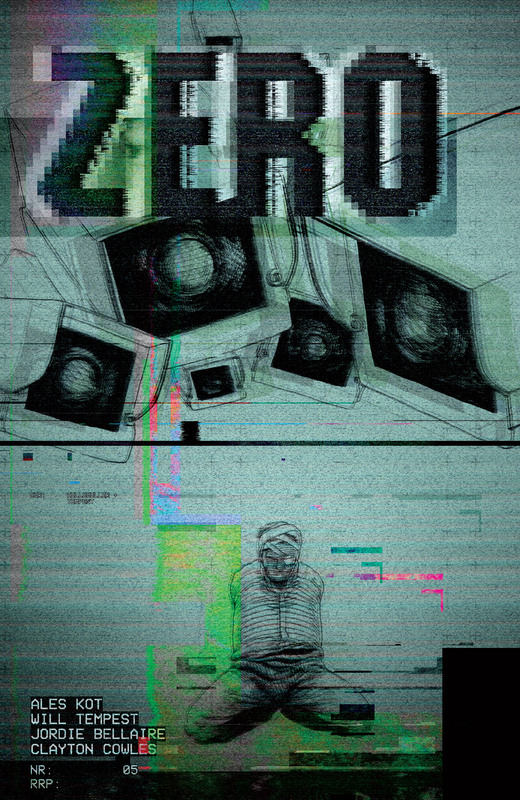 Zero is a comic approaching the spy drama from a very different angle. It is complex, mysterious and confusing at times, but it readily welcomes a variety of artistic creativity. The covers follow suit and are developed by Tom Muller, a Belgian graphic designer,t who has tried many a graphic typeface for this book. This was one of those covers that stood out on the shelf as I felt like I was peering into a security tape of an interrogation, one that breached basic human dignity. The lettering is deliberately imprecise and the footage is unclear. It serves to muddy the image and the subject material at hand. The white noise flickering effect throughout and the subtle attempt at colour insights a moving television channel, desperate for a clearer picture. The generic font used to state the details is identical to those stamping the time and date on security footage, showing great attention to detail. The most disturbing effect is what we are actually attempting to visualise. There are a host of surveillance screens peering down at a bandaged character bandaged and on his knees. All eyes are on him and he is not in a fit state to defend himself or talk. It very much represents the plot as the nefarious tactics of the superiors are caught on camera for the world to see, but I doubt anyone will really see this most secret of videos. Kudos to Muller for adventuring out of the realms of accepted behaviour, but let us be fair, that is exactly what this book is designed for. Previous PostRat Queens #4 – Just another all female group comic? Oh Hell No!